This large Shiplap tongue and groove storage shed is part of the great Shed-Plus DD range. It’s one of the larger size models which means it will accommodate a high level of storage. The windows are what make this shed stand out. Typically sheds feature one or two windows. So the fact this has six large windows is unique. They are all fixed and styrene glazed which means they are shatterproof, but won’t provide ventilation. It benefits from braced, wide double doors which offer a fantastic amount of room to manoeuvre awkward and large equipment into the building. So whatever you need to store, you can be sure it will fit through the doors. A hasp and staple has been added to the doors, which is a slightly better quality catch than a pad bolt. It also lets you attach a padlock which you will need to buy yourself. Supported by a 10 year anti rot warranty, the walls of the shed are dip treated absolutely free. This basically means you will not need to treat the shed after assembly or for a year or two afterwards. One of the more practical benefits of the shed is that it comes with interchangeable panels. So you can choose where you want the windows to be installed. Solid sheet materials whilst great for medium weight storage, are not suitable for heavy machinery or equipment. 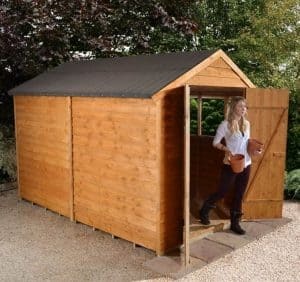 Part of the Shed-Plus DD shed range, this is a large size wooden storage shed. It boasts an impressive depth and width, making it great for storing large equipment. 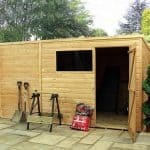 Usually with a shed of this size, you would be able to turn it into a spacious workshop. However, we’d recommend against doing that with this one due to its overlap construction and solid sheet floor. 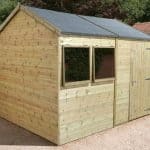 It is an entry-level shed and without upgrading the floor it simply wouldn’t be able to handle large, heavy machinery. The only thing that surprises us about the measurements of the shed is the width of the doors. For this size building they are a little on the narrow side. The average shed door measures 2’2” so at 1’10” the doors on this shed aren’t as wide as most competitor sheds. You still have a lot of room to transfer your storage, but if you’re looking for ultra-wide doors you may want to choose another model. OSB is used on the roof and floor, which is basically a resin bonded board. It is designed to be adequate enough to handle light daily wear and tear, but it’s going to provide as much support as a tongue and groove clad building. If your storage needs are simplistic and you don’t have anything large and heavy to store then this won’t be a problem for you. However, if you’re planning on storing large lawnmowers, BBQs or heavy boxes, the strength of the floor might concern you. It also puts a dampener on things if you are looking for a workshop space. The floor definitely won’t withstand the weight of large, bulky machinery. We are a little conflicted over the roof of this building. Firstly we love the apex design and the colour of the felt supplied with the shed. It contrasts beautifully with the walls and ensures the shed really stands out. However, like the rest of the building, the felt is made from cheap quality materials. So it isn’t going to last for years on end. The apex design does provide an exemplary amount of headroom, giving the building a tall, impressive design. To keep costs low, 8mm overlap cladding is used on the exterior walls of the shed. This is the cheapest style of cladding for manufacturers to use and the savings are passed on to the customer. Whilst it may not be as initially strong as tongue and groove, with regular treatments it will still withstand the unpredictable British weather for many years. It tends to have a rougher design than tongue and groove due to the rough sawn design. The panels are nailed over each other to form the overlap style. On the inside, European softwood has been used to create the 28mmx28mm framing which offers a good level of stability for the overlap cladding. Prior to shipment the manufacturer has dip treated the wood. This forms a very similar protective layer as a water based treatment, though it is slightly better quality due to its unique four stage process. It isn’t simply painted on, it is dipped into a cylinder and the treatment absorbs onto the surface before being dried. The manufacturer still recommends topping up the treatment after assembly and then re-treating it annually. If you do this you will benefit from the 10 year warranty against rot. Double doors reveal an excellent amount of access due to their very wide design. They have also been braced for additional strength and stability. You can casually walk in and out of this building without worrying about squeezing through the doorway or banging your head on the roof. This adds to its convenience and comfort of use. A hasp and staple is a slight upgrade on the typical pad bolt that is usually fitted to budget sheds. It works by keeping the doors shut when you aren’t using the shed. The six styrene fixed windows are perhaps the most unique feature. It’s unusual to see a shed, even one of this size, which comes with more than two windows. At the most they tend to have four. So the six shatterproof windows ensure you gain a huge amount of light into the shed throughout the summer months. They also come with the added benefit of being able to install them on either side of the building. If you live in a vulnerable area we would recommend investing in better security. This really isn’t the most secure or private shed available. The sheer amount of windows compromise privacy, though their shatterproof design does add to its security a little. The hasp and staple attached to the door is an ideal place to attach a padlock, but you will need to buy one separately. 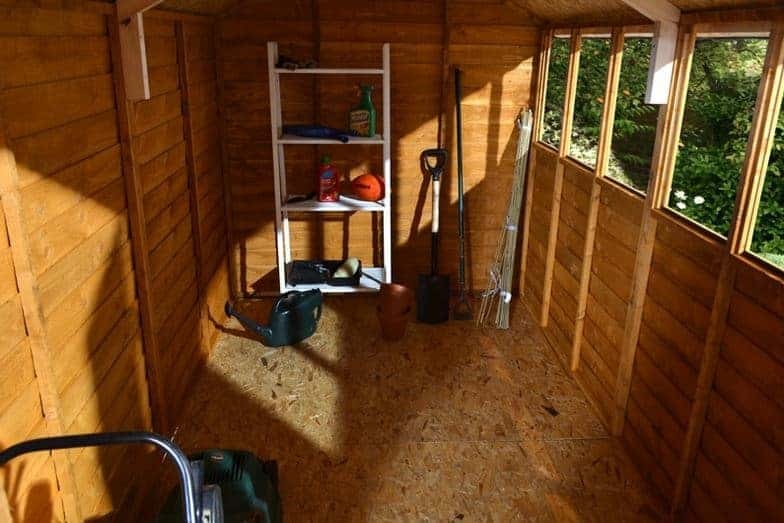 Unless you manage to really enhance the security of the shed, we’d suggest not storing anything of value in here. 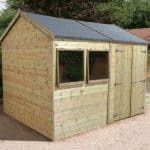 You can choose from three additional options with this shed. The coloured treatments are one of the most useful. 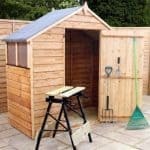 It is important to make sure the shed is treated annually, as well as after installation. So it makes sense to take advantage of one of the two treatments offered by the Shed Store. Choose from an elegant dark brown or a welcoming harvest gold colour. Both are water coloured treatments that have been especially created for use on rough-sawn wood. As overlap walls don’t enable you to hammer nails into them, the hooks supplied by the Shed Store are a great investment. Like the treatments offered, these hooks have been created with overlap sheds in mind. Rather than being hammered into the wood, they instead slot over the overlap cladding. You still won’t be able to hang anything heavy from them, but it does increase the shed’s storage capacity a little. The solar light is your last customisation option. We like this light as it provides a very bright light without needing to be installed into the mains. It runs via a remote solar panel which charges up through the day. Containing 6 LED bulbs, the light is very bright and lets you see what you are looking for during the night or on dark, dull days. Compared to other similar size overlap sheds, this one does boast a slightly better quality. The styrene glazed windows add to its impressive design. 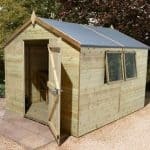 We think it’s one of the best value sheds available. As long as you don’t store anything hefty in the shed, it should last for a long time to come. This is dependent upon how well you keep up with its treatments however. It does need annual treatments in order to protect it against the seasons. The shed has been dip treated so this does improve its longevity quite a lot. There’s a lot of storage space included inside the building, but you cannot install hooks or shelves onto the overlap clad walls. The solid sheet flooring is also not suitable for hefty, large tools or equipment. These things do need to be considered before buying the shed. The amount of windows on the shed are going to make it slightly harder to assemble. It will lengthen the amount of time it takes to erect, though the instructions do make it slightly easier. We would definitely advise leaving 3-6 hours for the installation of this building. 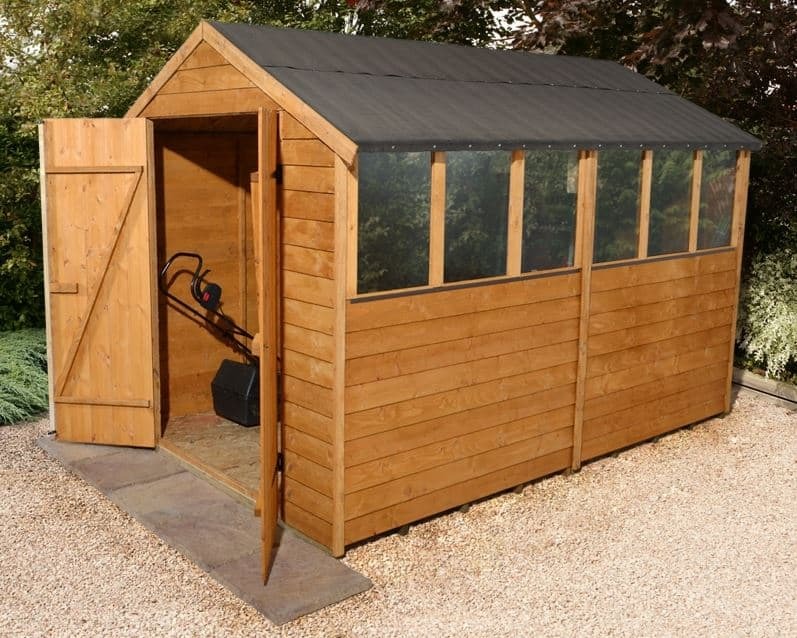 This is an extraordinary shed and offers substantial value for money. Taking into account its huge size, unique design and free dip treatment, this overlap shed has been built to last. 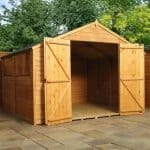 Final Thoughts: If you’re on the lookout for a shed that offers value for money with a unique, distinctive style then this is the one for you. Six styrene glazed windows ensure the building has a substantial amount of light, though the fact they don’t open is a little disappointing. The manufacturer advertises this as a potential workshop, though we wouldn’t advise using it as one due to the weak solid sheet floor. The building offers fantastic access via wide, braced strong double doors. Overall it’s a great quality shed, with the only thing we’d really recommend changing is the felt. It boasts a stunning contrasting design, but the quality could be better. However, this is very easy to change and the cost of high quality roof felt isn’t overly expensive.